East Cheshire Hospice is supporting a campaign aimed at widening access to services nationally. Open Up Hospice Care reaches out to community groups missing out on vital support, including those caring for loved ones at home. A survey commissioned by charity Hospice UK as part of its campaign found that 72 per cent of adults believe support from a local hospice would make them feel more confident supporting a loved one with a terminal condition at home. 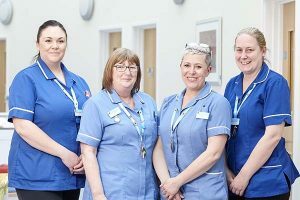 For its part, East Cheshire Hospice has been at the forefront of in-home care, launching its hugely successful Hospice @ Home service 18 months ago. The ComRes survey also showed that half of UK adults (48%) are aware that hospices receive the majority of funding from fundraising and donations (e.g. via charity shops, communities, lotteries). Almost a fifth incorrectly think that hospices receive the majority of their funding from the NHS. East Cheshire Hospice receives under 17% of its funding from the NHS. Amy Chatwood, Marketing Manager at the Hospice, said: “At the end of a person’s life, we only have one chance to get it right and that is why the hospice movement is there to provide expert, compassionate care.